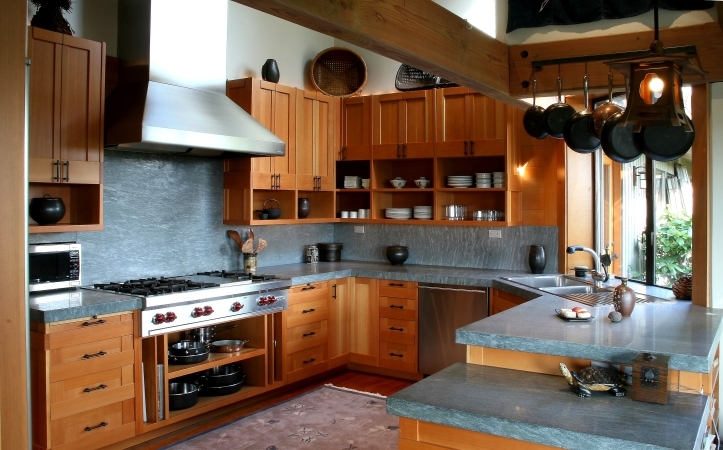 An existing kitchen remodel for an owner who admires both traditional Japanese architecture and Frank Lloyd Wright's work, and has an extensive collection of Japanese crafts and furniture throughout the home. In keeping with the owner's goals, this is a contemporary design embodying the spirit of these precedents without creating a literal copy. The design is highly functional, has an organized simplicity and calm, but also has extraordinary warmth and richness, the product of the simple use of natural materials (douglas fir custom built cabinets [designed by Lovegrove Design], schist countertops and backsplashes, stainless steel fixtures and appliances, and cherry floors) and a refined articulation of the parts of the design, with simple modular cabinet layouts, patterns, and relationships between parts. There's a sense of organized relationships between the parts and the whole, which is very satisfying to experience and live with. The details were developed to provide both a sense of the craft that went into the design and construction, as well as a feeling of warm elegance and refinement.